This was purchased for my son for his room. It was better quality than what we were expecting. The cloth was soft and was very warm. I will be purchasing another for my daughter's room. Complete your bedroom with this comfortable and elegant pintuck comforter set that adds visual interest and unique sophistication to any space. Its soft fabric is cozy, machine washable, and available in a wide range of colors. Dimensions 23.0 In. X 20.0 In. X 10.0 In. This is a really nice set! I read other reviews prior to purchasing, and noted that some buyers said "it shows cat hair." Well, it does - want to know why? Because I have a CAT! If you want something that doesn't show cat hair, either don't have a cat or buy a comforter with a busy pattern. Solid colors will show pet hair. Now then. The bed skirt fits perfectly, on my California King, unlike others I have purchased from Overstock. The pillow shams are made so that you can easily get your pillows in them, but don't appear to be overly loose - that's a tough combination, but the manufacturer nailed it. 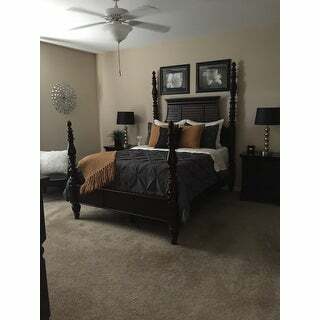 The comforter is warm, and large enough to have a good length of drape on each side. My only issue is that a couple of the pinch pleats "pulled out" less than a week after I put the comforter on the bed. I can repair this on my own, but it's the reason I only gave this set 4 stars. The stitching shouldn't have pulled so quickly. This is a great set. I bought it to layer with other blankets and it works perfectly for that. I purchased a King for a King size bed, but it is short on both the sides and the length, which is why I deducted a star. The feel of the material is very luxurious and soft. The pleats have held up well and none have came apart, as I’ve read in earlier reviews. A gorgeous comforter and two shams, again, perfect for a layered look. I love this set ! The color is a perfect soft grey tone ,looks great on my platform bed which is a darker grey linen look fabric. I purchased this for the winter months as it is a little more fluffy and warmer while it is cooler out ! I have not washed it as of yet , so I am hoping it comes out great ! But overall I am happy with the fabric of this comforter as it is not the silky shiny stuff that slides around ! The pillow shams are like all shams , pillow just slips in , no ties or velcro in the back.Would purchase again ! I have had this queen-sized comforter set for about a year. I use this comforter during the air-conditioned summer months. It is soft and light-weight. The queen size is wide enough to cover my mattress adequately. Also, I have had no trouble with the pinch pleats coming apart as some reviewers have reported. If I ever have a need for another comforter, I would most definitely consider buying this comforter again! I ordered this comforter in Burgundy. The color is muted and a bit more on the brick red side but it still works with the burgundy drapes I currently have. I read the dimensions (King) and have ordered that size before but this comforter is big. It actually drapes well over the sides and the bottom of the bed and comes all the way to the top. I rescue animals and have a house full of cats and dogs. The material is very cat friendly - no pulls. I'm very pleased with this purchase! As a lady who sews, I'm always shocked at what manufacturers try to sell. NOT THIS TIME, FOLKS!!! This manufacture, this comforter set has the most detail, perfect sewing EVER!!! And I looked, TRUST ME!!! Deciding upon the white for a guest room, it had to be perfect. THIS COMFORTER SET IS!!! Still speechless. WISH THEY MADE MORE ITEMS!!! EXCELLENT QUALITY, PERSONAL NOTE IN PACKAGING, DID NOT GO UNNOTICED!!! The room is so inviting and relaxing. I just want to go in there and sit. PLEASE, PLEASE GIVE THIS MANUFACTURE A CHANCE. YOU WILL NOT BE DISAPPOINTED!!! I have a large high efficiency washer but still have a problem with finding comforters that fit and get fully clean. We have 2 large fur babies that sleep in the bed with us so I have to wash the bed linens 1-2 times a week. This comforter looks expensive and thick but easily fits into my washer. It is nice and warm. Recommended! It's very pretty, it looks "rich" and it's comfy! What more could you ask for in a set. On the Overstock end of it...I ordered 2 twin, they sent me 1 twin and 1 full size. When I called, because I really did need 2 twin they told me the twin was sold out and that's why they sent a full. I ended up switching the twin out for another full and it works. A bit of a pain but I'm super happy with the product itself. 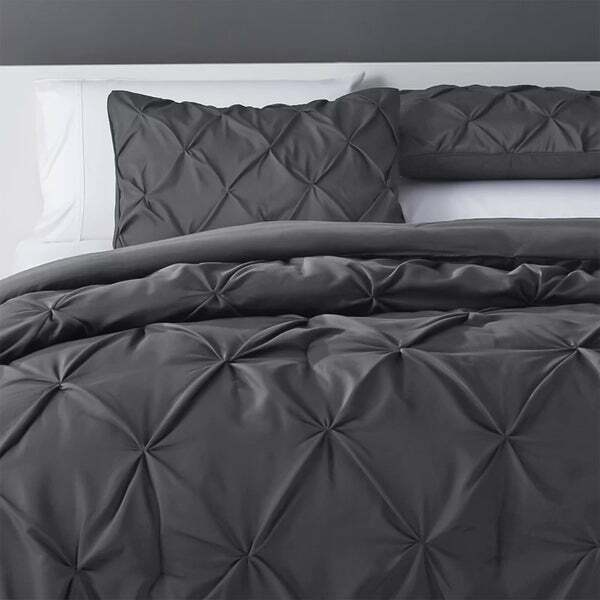 This comforter is very pretty and looks great, but it is so hot- I wake up every night sweating. Also, it does not fit in a normal size washer, it's too puffy, so unless you have an industrial washing machine it either has to go to the laundromat or dry cleaner. Unfortunately, I have to buy a new one. So great that when it came in my son took it for himself..
Had to return. The cali king comforter didn't even cover the surface of our bed. The color did not match the color advertised. It was easy to return and got my money back. This comforter is absolutely beautiful. I love the look of the pintuck design; very luxurious. The comforter is very soft and the pillow cases are nicely sized. My only qualm would be that I do wish it was a tad bigger. I bought the Cal King size and it fits the bed, but it would be nice if it was a bit larger. Otherwise I love it. I would def recommend. For the price, I expected to use this bedspread to stage our home we were selling and that would be it.... here we are 4 years later and still using it! Well made, still in excellent shape, and absolutely love it! Love this set and it looks great ! Makes the room looks bright. Beautiful and just as expected! Very soft too. We LOVE it and I’d definitely purchase this again! It is not too warm but just warm enough. It’s perfect for us! This is a very nice set. Made well. Couldn't be happier and I would recommend this product. "Is the comforter set available in Burnt Orange? I want to order 4 if available!" "It the light blue a true blue or an aqua green? I bought a comforter that looks identical from * in "Misty Blue". It arrived today. It is Aqua green. No blue. I'm looking for a blue with gray hue's, not green." This is a true light blue color. "Can the Cal. King fit in a large capacity washer with the agitator? How well does it fit in the dryer? Is it light weight and not bulky?" "Does the Cal. King fit in a large capacity washer and dryer and does it wash and dry easily?" The California king comforter can be washed in a large capacity washing machine, preferably with no center agitator. We recommend to wash in cool water with a mild detergent and to dry in a low heat setting. "Does the full set have a bed shirt"
No,the set does not include a bed skirt. "Will you restock charcoal in twin? I would like to buy 2! " "Hi, does is this a comforter that is thick? Does it have a zipper? " It's not that thick, it is light and it does not open up so no zipper. It looks like the picture and it's nice for the price.